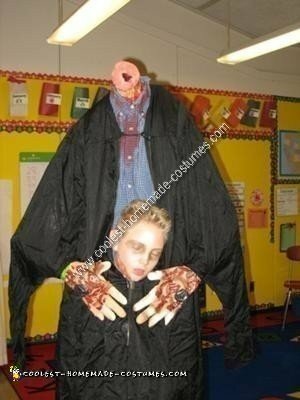 Found this homemade headless boy costume idea from this site! Everyone loved it! Used parts we had at home and cost only 5$ for the fake blood and make-up! Used an old Star Wars kite and stockings filled with plastic bags… an old foam head minus the head – pretty cool and very scary!